Too Big For Texas: U2's 'Claw' Vs. Cowboy Stadium What happens when the biggest stage show in rock and roll history — U2's 360-Degree Tour — sets up in the biggest domed stadium in the world — the new $1.2 billion Cowboy Stadium? The answer is obvious:big problems. What happens when the biggest stage show in rock and roll history -- U2's 360-Degree Tour -- sets up in the biggest domed stadium in the world -- the new $1.2 billion Cowboy Stadium? The answer is obvious: big problems. Although they've scorched crowds with some of the most incendiary concerts of the past decade, the Irish rock band has not attempted a run of stadium shows since 1997's much lambasted and remote-feeling PopMart tour. The 360-Degree outing, with its massive in-the-round stage set known affectionately as "The Claw," is intended to solve the intimacy problems of playing to crowds upwards of 80,000. The thinking: if the stage is almost as big as the stadium itself, no fan will be left behind. Did it work in Dallas? Find out after the jump. First, the numbers: with an operating budget of $750,000 a day, U2's tour employs nearly 400 people and 200 trucks to move three separate versions of the same 170-ton set from venue to venue. 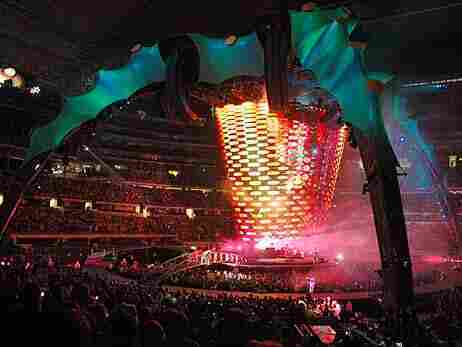 While U2 performs on one set at, say, Cowboy Stadium, another is being assembled at the next tour stop in Houston while a third is being transported for an upcoming gig in Oklahoma. The $40 million tangle of steel requires as much as 8 days of set-up and breakdown -- for a two-hour show. Cowboy Stadium accommodates over 100,000 fans. Its high-definition video screen -- again, the biggest in the world -- weighs the same as a 747, runs 60-yards in length and is suspended so ostentatiously at midfield that the showplace venue suffered a national embarrassment before it formally opened. In a preseason game against the Dallas Cowboys, Tennessee Titans punter A.J. Trapasso sent a kick right into the low-hanging guts of the thing. Whether the Claw helps U2 hit its fans in the gut is something we'll never know in Texas. Taken separately, the Claw and Cowboy Stadium are epic feats of engineering, but throwing them together was like trying to wedge the Guggenheim Museum into the foyer of the Met. As soaring as Cowboy Stadium is, it couldn't accommodate the Claw. The structure, which is designed to play at dead center of the field, had to be shunted into an end zone because of the looming GinormoTron, leaving tens of thousands of fans, well, a football field away from their favorite rock and roll band. It caused the whole show to feel a little off, too -- almost as if Bono and his mates sensed the loss of the centripetal, focusing force of their spectacular set. But as anyone who has tracked his numerous global initiatives knows, Bono loves a challenge. And despite the need to enthrall the masses -- over 70,000 attended the Dallas show and larger crowds have made dates in New York and Los Angeles sell-outs -- the U2 song list doesn't pander. The band fearlessly pushed forward material from its new No Line On The Horizon album and paraded -- through the use of video images and Bono's impassioned preachifying -- noble causes ranging from the staunching of AIDS in Africa to the pursuit of justice for the persecuted Burmese-goverment opposition leader Aung San Suu Kyi. "Just sing!" protested some of the Big D crowd. 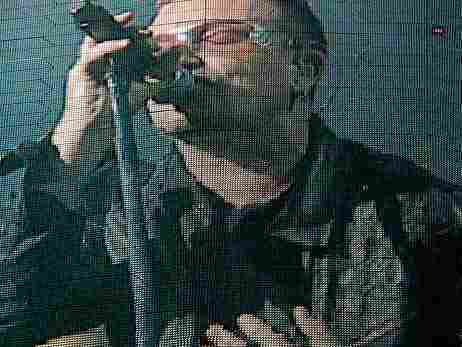 That is, until Bono thanked local icon George W. Bush for his contribution to the fight against AIDS. The mention was met with an ear-shattering roar, proof that even in an age of garishly outsized sports palaces and over-the-top entertainments, the oldest trick in the book -- name-checking a good ol' cowboy -- can bring down the house.